This entry was posted in Picture Books and tagged A GREAT Nephew & A GREAT Aunt, collaboration, Landon, poetry, Poetry Friday. Bookmark the permalink. This needs further development…into a picture book!!!! Fantastic! Brilliant! I love the poem and the artwork–they’re both cleverly executed and beautifully compliment each other. Great fun! That is absolutely adorable – both the poem and the art! I am a HUGE (okay, obsessive) tea drinker, so that one is extra special! Can’t wait, Renee. I’ll keep the water hot and the teacups ready. This is possibly my favorite episode so far, Penny. LOVE your poem – it hits the sweet spot for me in terms of humor and whimsy – and Landon successfully captures that same sense of delight in his illustration. Thanks, Michelle. It’s one of my favorite episodes, too. I think the poem/picture pairing is especially perfect this time. Thanks for coming by! Thanks for coming by, Mary Lee. Hi Cupcake? Do you like to have tea with camels? I like tea, but I’m pretty sure I’m afraid of camels. These just are great, Penny. I love your sense of humor always, and it seems that Landon is a chip off the artist’s block. What fun! Loved your poem, but Landon’s picture made me chuckle. He certainly captured the poem with humor! I chuckled, too, when I received his illustration via email. He did capture the humor in a way I hadn’t even thought of. I love the camel lips blowing on the tea! Sorry you’re sick, Carrie. I’m glad we were able to brighten your day. Oh, my. Love the poem and the artwork is perfect. So much fun. Thanks for this post. 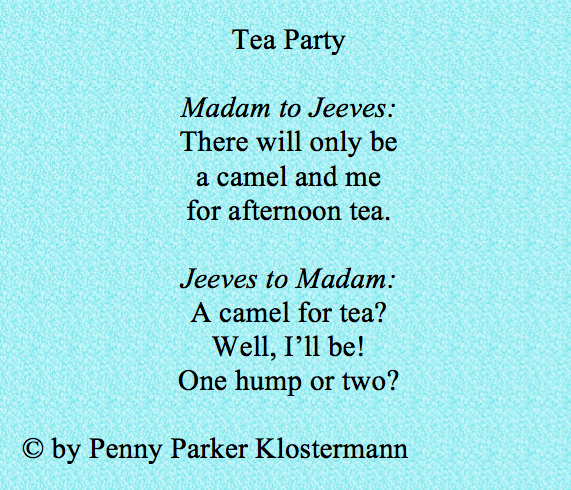 Landon has chosen two humps–love the way the tea cups balance on the humps, and the camel cools them down. Me too, Buffy! Cooling one cup by blowing and one by flipping his tail. Thanks for joining us today. Fun poem, Penny, and I love the detail in Landon’s picture, right down to the sugar cubes. Sweet! Thanks, Carrie! “Sweet” is right! As always, a “great” team! Very cute. Thanks for stopping in, Carmela. OMG! 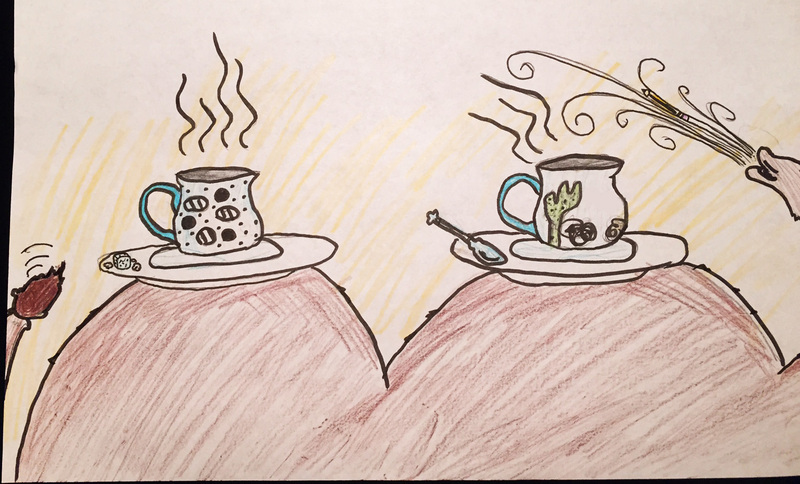 Love this — cute, funny poem + the illustration is fab fab fab — love the way Landon has decorated the mugs :). He did a great job with the mugs. I love the cactus. Two humps here! Cute poem. Perfect illio. Har! Har! I’ll take two humps, please, and if you don’t mind – I will sit between the humps to steady my cup as I sip. The camel is a lot more fun. They have two humps instead of one! Great job Landon and Penny! Earl Grey for me, please. Adorable! I love how the camel is blowing on his (or her) tea to cool it down. Great detail, Landon. Penny — I’m getting ready to take a road trip this weekend. What audio book did I borrow from the library? One of the Jeeves novels, of course.